The City Lights Orchestra has enjoyed a strong and close relationship with the Archdiocese of Chicago for many years and we have continuously supported the church and it's mission with our music. Last year, during the Cardinal's 50th anniversary Jubilee celebrating his ordination to the priesthood we presented "The Cardinal's Christmas Concert" at the legendary Holy Family Church in Chicago. 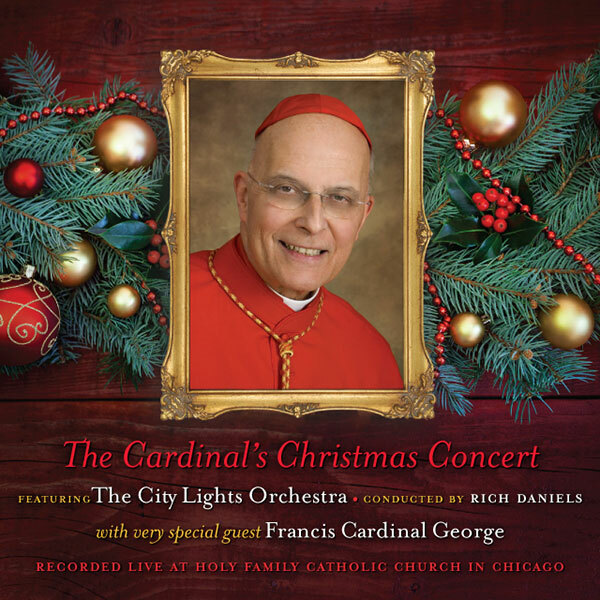 We were able to capture this concert on tape, and so now, during this time of transition, in honor of Cardinal George, we are offering a limited pressing edition of: "THE CARDINAL'S CHRISTMAS CONCERT"
This recording includes inspiring sacred and secular Christmas selections as well as Cardinal George reading the beautiful Christmas Gospel according to St. Luke. The Cardinal also recorded special material that captures his reflections of growing up in Chicago and the Christmas of his youth. Please help us honor Cardinal George as he steps down as the Archbishop of Chicago after 17 years with this beautiful tribute. Supplies are very limited. Please place your order soon. Payment must be received before order can be shipped. The City Lights Foundation is an Illinois 501c(3) non-for-profit corporation. All donations are fully tax deductible up to the extent of the law.